For numerous homeowners it seems fighting pests is a constant battle. Homeowners spray until their homes are the equivalent of a toxic dump. Spray is brandished around doors and windows, similar to how holy water and garlic were used during the middle ages to ward off vampires and other evil. It often appears to be a battle won by the pests, and lost by the homeowner. Thankfully there are pest control solutions to the invasion. When you have decided to throw in the towel, call The Bug Dude for Pest Control in Fort Worth. Recently in the news was a report of global warming’s effect upon insects, with some species of spiders growing to unheard of sizes in specified parts of the country. The process is very simple. With global warming, they have a larger food supply due to the rise in other insect populations, leading to healthier and longer lived and larger spiders. They are also producing larger broods. It isn’t simply spiders, but numerous bugs are proliferating in the warmer weather, keeping professionals in pest control in Fort Worth busy. In some areas of the country drought has brought about a new problem. Home gardeners are used to battling deer and the occasional rabbit over their home grown veggies. But this past summer has brought out record numbers of starving squirrel and even rats from the forests to feast upon garden vegetables. The general consensus has been food is short in drought affected areas and the opportunists are looking for meals wherever they can find it. The science is simple. When conditions are favorable the number of prey rise, while the number of predators keeps pace. It’s a foregone conclusion that theropod dinosaurs such as T-Rex were happy with the arrangement. But for humans, when the creatures are bugs, it spawns shivers and shakes and a no bugs’ allowed attitude. In the field of science, new invasive species spark research in the lab eventually providing a means of eradication or pest control. The Bug Dude Professionals stay on top of the research taking note of new findings and habits of pests, and analyzing current data for the most effective means of addressing the problem pest with pest control in Fort Worth. 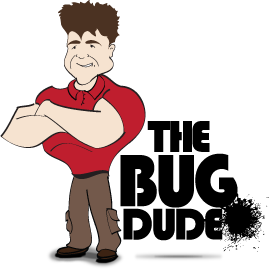 The Bug Dude can help you with your pest problem. By using professional pest control in Fort Worth, and good anti-bug practices at home, your pests can become a thing of the past. Vacuum carpets and rugs often. Have leaks repaired indoors and out. Bugs seek out water. Don’t leave food or leftovers out. Bugs seek out food. Repair holes and replace torn or poorly fitting screens. Replace worn weather stripping around doors and seal cracks and crevices. Replace worn door sweeps. Trim shrubs at least 1 foot away from the home. Planting beds should be at least a foot away from the home as well. Trim tree limbs that hang over your roof. Store unrefrigerated food in sealed containers, this includes grease and leftovers. Store trash in tight garbage cans and take out often. Store recycles in tight containers and also rinse out before placing it in the can. Don’t leave pet food or water out overnight. Store firewood at least 20 feet away from your home. Seal holes around plumbing and cables with steel wool. With the coming of fall, pests will be seeking a way into your home, for warmth and food. Schedule your professional pest control in Fort Worth now. If your home treatments aren’t working, and you want your home to remain a no bugs allowed zone our professionals can help you. If you have an infestation, call to schedule an evaluation and pest control in Fort Worth with a qualified specialist from The Bug Dude. We serve Fort Worth and the surrounding areas. Thanks for visiting The Bug Dude.